Pakistan will be playing Australia in 3 one day internationals in late August. Pakistan should fancy their chances of winning the series 3-0. Australia in their last two ODI series have drawn 2-2 vs. West Indies away and lost 4-0 vs. England away, even though they did win the commonwealth bank triangular series earlier in the year at home against Sri Lanka and India. When Australia last toured the Emirates in the first part of 2009 they came out on top 3-2. Dav Whatmore will be up against his home country during this series which initially was set to become the longest ever Twenty20 international series compromising of as many as 6 matches, but that of course has been changed now with the tour consisting of 3 of each, 50 and 20 over internationals. Pakistan have lost both of their ODI series this year against England and Sri Lanka. However, they are still a strong one day side, winning the most one day internationals in 2011 with 24 out of 31 victories and winning the Asia Cup this year for just the 2nd time in their history. A strong side should bounce back. Australia are still officially the number 1 ranked side, but in these conditions Pakistan should be settling for nothing less than a series win and winning all 3 of the games. Pakistan have won each of their last Test, ODI and T20 against the Baggy Greens. Pakistan’s tour of Sri Lanka was disappointing on several fronts. Just like in 2009, they come home beaten in both the major formats of the game. However, there were some bright individual performances and players who caught the spotlight this time. Encouragingly, for Pakistan it was the younger players in the side. Azhar Ali, Asad Shafiq and Junaid Khan all boosted their reputation as the future of Pakistan cricket. Pakistan’s 7 series unbeaten streak in test matches finally came to an end, however Misbah ul Haq maintains the highest win/loss ratio in history of the game after captaining in now 17 tests. Technically, one can perhaps argue that he is still unbeaten in series given he did not play at Galle during the 1st test (which was lost & decided series outcome) due to somewhat of a questionable suspension. Despite losing the series, Pakistan have now entered the top 4 in the ICC test rankings, the highest position currently by an Asian side. The current England – South Africa series is one that must be eagerly followed by the Pakistani fans & management. For one, you have Pakistan further strengthening their position on the ICC test championship if England wins. For two, Pakistan will be touring South Africa at the beginning of next year and therefore they will want a thorough look at the opposition they will be up against. 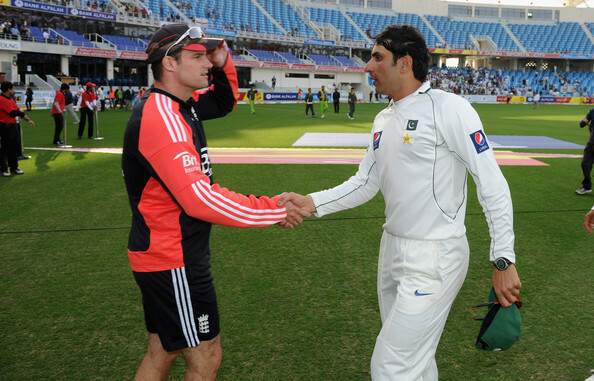 Thirdly, given that Pakistan whitewashed the world number 1s, their finest hour in their history up to now, they will want to see how phenomenal the achievement is or if they had started the beginning of a declining period for Strauss and co.
England were outclassed at the Kia Oval during the series opener. After dominating the first day with Vice-captain Cook reaching his 20th test century for the three lions, the visitors bounced back and in the end sealed an innings win over a side that are a formidable force on home shores. Hashim Amla became the first South African to achieve a triple century, and it was unbeaten too. The artistic batsmen made the English attack toil and rather made them look very ordinary. Kallis eased his way into the series with an unbeaten century in an unmoveable 3rd wicket stand between the two big right handers. Smith celebrated his 100th test in the best fashion possible, bringing up 3 figures as his unorthodox play irritated the life out of the English attack. Dale Steyn and Imran Tahir then came to the party and showcased their skills on a wearing track as the hosts not only lost the test match, but in the process failed to make South Africa bat again when Asad Rauf raised the finger to an ever-passionate Imran Tahir appeal. One wonders if Smith and South Africa will see the back of a 3rd long term England leader. We’ve had Nasser Hussain in the 2003 summer, Michael Vaughan in the 2008 summer and now Andrew Strauss could be under the firing line in 2012.
forming the foundation for limited over success as well and not at the expense of it. South Africa have got everything. All bases are covered - A left-right hand opening combination, a powerful experienced middle order capable of attritional grind, inventiveness and assertiveness, a potent and highly threatening seam attack and now also have the services of a journeyman leg-spinner in the form of Imran Tahir. Finally, an athletic fielding unit and reliable slip cordon. They have a knowledgeable bowling coach in Donald who knows the tricks of the trade better than most and a head coach in Gary Kirsten who is well respected & highly successful. On paper, they are the best test side out there. That of course can become a reality once this series has concluded and there is every chance Pakistan will be up against the World Number 1s to commence their calendar year in 2013 as well when they will tour the African continent for the first time since early 2007.
moment to consider the reaction if they manage to draw or win against them. How highly that would be regarded both in terms of the achievement itself and the overall rating of the team which will only get more impressive than it already stands. Conquering South Africa has to be a long term vision for Mr Whatmore and Misbah ul Haq. They must start planning and preparing for that series soon if they want to give them a chance. It has to be at the top of the priority list. The lack of potency in the seam attack is an area of concern. Umar Gul was out of sorts in Sri Lanka as the spearhead of the seam attack, sending down 62 overs for the solitary wicket. He will definitely need to lift his game and be at his best if Pakistan is to stand any chance. Usually 3 seamers is the way forward in South Africa, but does Pakistan possess the quality to follow the formula and bench one of their key performers in the side’s resurgence, Abdur Rehman? I do believe the batting will do alright; their patience and discipline levels are that high that they will find a way of sticking it out, coming through and putting totals on the board. If you are temperamentally unflustered, the occasional technical deficiency will be overshadowed with sheer grit and determination. Taufeeq Umar has fond memories in this part of the world. Azhar Ali and Younis Khan come to mind when talking about batsmen who are technically well equipped to score consistently everywhere. Misbah ul Haq used to captain Imran Tahir at the Pakistan “A” side and the effectiveness of the wrist spinner should be limited against a middle order who know the bowler and play spin well. Pakistan unfortunately does not play much high profile test cricket between now and the 3 tests in Johannesburg, Cape Town and Centurion next February, but they need to start thinking seriously about this series and planning accordingly. Priding and protecting their top 4 status in the real business is a wiser long term priority for a side with the 3rd highest win/loss ratio in the 5 day game after Australia and England. The 9th youth World Cup will be held in Australia from the 11th-26th August 2012. The format is the standard one which has been used for this competition for some time with 4 initial groups of 4 teams followed by the knock outs starting with quarter finals, semi finals & a final. Specific matches are televised, including the ones from the semi final stage onwards. There is also 3rd & 4th place play offs & 5th & 6th place play offs once a side has been eliminated. Over the years many players have represented their countries at the under-19 level that have gone on to make their name at the very top level. Examples include Mushtaq Ahmed, Inzamam ul Haq, Owais Shah, Graeme Swann, Mohammad Kaif, Yuvraj Singh, Virat Kohli, and Hashim Amla to name a few who have made the transition. From the previous tourney names such as Mitchell Marsh, Ben Stokes, Hammad Azam, Danny Briggs amongst others have gone on to be awarded international caps, although that has been restricted to limited over matches. Below are 7 players that are worth keeping a close eye on in the forthcoming youth world cup. Highly rated talented top order batsmen & also holds the responsibility of skippering the Indian u-19 national side. Chand led India to the quadrangular series win against Australia in Australia in April where England & New Zealand also competed. Despite losing all 3 group matches in a 4 team competition, India went on to win the competition by winning the semi final & final. In both the semi final & final Chand won the player of the match award & led from the front when it really mattered. During the Asia Cup, Chand scored 121 in the final against Pakistan in a difficult chase & was adjudged the player of the match, carrying the innings through till the 50th over in a 280+ chase during a tied encounter. No stranger when it comes to playing in front of the cameras as Chand has played for the Daredevils in the IPL which should give him an advantage going into the youth world cup. With the world cup also happening in Australia, Chand will be full of confidence knowing he has performed in this part of the world already this year. Reliable left handed opening batsmen. Sami was the Player of the tournament during the triangular series in South Africa earlier in the year & carried the bat with an unbeaten double century during a televised match vs. British Universities in Lahore in April. The 16 year old made his first youth ODI century in his 2nd international, in alien conditions & never looked back since. Aslam has formed a mouth watering opening partnership with captain Babar Azam with both tipped to make it to the top level in the not too distant future. The opening combination is an area where Pakistan will be relying heavily on & has been the key to their success in under-19 cricket in recent times. Sami’s batting inspiration is Suresh Raina. In the recent Under 19 Asia Cup in Malaysia Sami Aslam was the player of the tournament & also got the award for the best batsmen in the tournament, memorably scoring back to back centuries against India in his first 2 games against them, including in the final where he was awarded the player of the match award alongside Chand. Might only be 16 on paper, but one of the key names on the team sheet, achieving 6 man of the match awards during his first 6 months as an under 19 international cricketer. From an interview I conducted with him he came across as an ambitious & confident person in general. On a technical note, Aslam has a range of scoring shots & has the capabilities to build an innings from what was mentioned in the same interview. We will see how accurate his self-assessment is, but if his record is anything to go by it seems like he has a steady head on his shoulders, fully aware of his strengths & overall game plan. Away from the field of play, Sami is still carrying on with his studies at GC University, taking challenging subjects & despite missing large parts of the year to cricket he manages to perform well in examinations. This shows he is a well-polished individual which is something Pakistan players traditionally lack, barring a few exceptions & therefore is clearly one that needs to be taken care of in order to be the best possible sporting role model down the line that he can be. There is little doubting that he will play for the national senior side within the next 5-7 years if not sooner. Left arm fast bowler with a gigantic height of around 6’8. Reece plays club cricket for Colchester & has represented Essex at first class cricket, making his county debut last season at the age of 17. He was once struck brutally in the face to a KP straight drive when netting as a net bowler in his early teens. As a result Reece was out of action for some time, but recovered well & in April 2011, Paul Grayson, the Essex coach, confidently handed him over the chance to debut. Reece didn’t disappoint, but academic commitments limited his chance to play on a regular basis. I have been in touch with quite a few of the Pakistani U-19 players & all of them rate this South African captain, wicket keeper & destructive hard hitting opener highly. During the triangular series earlier in the year De Knock dispatched the Pakistani bowlers all over the park in some of the games. The wicket keeper batsman has played quite a lot domestically already in South Africa with a promising start to his career. Sounds like an exciting prospect & a dangerous one too. Surely you have heard of him? Cummins got an early test debut at 18 last year during the tour of South Africa. He bowled with heart & hit the winning runs during the 2nd test of the series where Michael Clarke’s side bounced back to level proceedings. A handy lower order basher as well, scoring a half century in 24 deliveries during the course of the quadrangular series in Australia in April. Batsmen will have their work cut out to handle his pace, movement & bounce on pitches he is familiar bowling on. The Irish left arm spinner who has been an integral part & a front line performer for the senior side over the years. Dockrell possesses a wealth of experience for someone of his age, travelling & performing all around the world in a variety of competitions at the international level. Logically, he was the obvious choice to lead the Irish under 19 side while he is still eligible to represent them. George who plays for Somerset has all the craft, guile & subtle variations to keep things tight & get breakthroughs in the middle passages. George has voiced aspirations to play test cricket for England down the line. He was found wanting at test level, regularly troubled in the corridor of uncertainty by Ben Hilfenhaus’s outswingers, but he would have learnt plenty from the initial taster of international cricket. To his credit, he did show us glimpses of his potential. It is debateable as to whether he was thrown into the deep end too early in the piece. One moment that will last in his memory is knocking over the man universally known as the ‘Wall’ in his penultimate test series as a player by disturbing his furniture as a bowler. Kraig is primarily in the team as a top order batsmen, but also useful in other aspects of the game. West Indies youth side could really benefit from his presence & will be looking for him to put in exceptional performances. At this level he is capable of dominating & stealing the headlines as a more recognised name. I expect Australia, Pakistan, India & South Africa to win their respective groups during the preliminary stages & therefore win an easier quarter final tie. Barring South Africa who I feel will be beaten by England via A2 v D1; I see the following teams making the final 4. Any of these 4 teams can go on to lift the title; there isn’t much to choose between them. All of these 4 teams are the only 4 holders of this trophy & I suspect one of them will go on to lift it again. If I had to choose I would say that Australia & India will make the final will Pakistan coming home with victory in the 3rd place play off. What the Pakistanis have going in their favour is they have members in their squad who played in the last one of these World Cups in New Zealand 2.5 years ago who would have learnt plenty from the experience & would be determined to go one better this time around from being finalists. Australia as defending champions, hosts & the most successful side in this competition with 3 of the 8 titles going to them are the favourites. It would be unfair to dismiss West Indies & Bangladesh who are two tough teams at this level & both cannot afford to be underestimated. West Indies were 3rd place winners in the last one whereas Bangladesh defeated England 5-2 when they came over for a tour not so long ago. Pakistan have named their 15 man squad for the under 19 World Cup in August. Pakistan will play 3 youth one day internationals against Australia & 2 warm up matches against England & Papua New Guinea before the real thing kicks off with their opening fixture against neighbours Afghanistan on the 11th of August. Babar Azam has been retained as captain & Umar Waheed will continue to be his deputy. Pakistan were runners up during the triangular series in South Africa, winners of the youth one day series against South Africa, winners of the 2 games against British Universities in Lahore & joint winners of the Asia Cup in Malaysia after a last ball tie against arch rivals India. Pakistan’s stand out performer this year has been Sami Aslam who was player of the tournament in both the triangular series in South Africa & the Asia Cup competition in Malaysia. Sami also scored an unbeaten double century in one of the 2 games against the British Universities touring side. Mohammad Nawaz has been the other bright spark with 3 man of the match awards & three 5 wicket hauls in 50 over games this year. Sami is a left handed opening batsman whereas Nawaz is a left arm spinner who is the best all-rounder in the side. As a keen follower of the under 19 side the 5 key players in my honest assessment will be Sami Aslam, Babar Azam, Mohammad Nawaz, Umar Waheed & last but not least Usman Qadir. Usman Qadir has been named in the squad after recovering from a thumb injury which made him miss the final of the Asia Cup earlier this month. Salman Afridi has been favoured over Saifullah Bangash as the wicket keeper. Bangash was the keeper during the tour of South Africa whereas Afridi did the work behind the stumps during the recently concluded Asia Cup. Coach Sabih Azhar is confident & hopeful of the team’s chances & feels many of these players can break into the national side in the near future. One thing which has surprised me is the doubts & question marks which are being raised regarding Taufeeq Umar’s place as Pakistan’s test match opener. 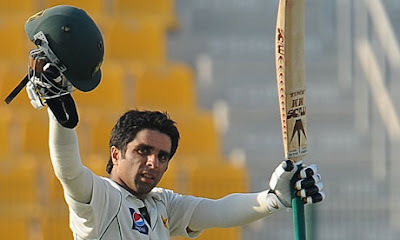 Taufeeq has 3 centuries & 4 half centuries in 29 test innings since being recalled into the side. He was Pakistan’s leading test run scorer last year. He has opened in 15 consecutive test matches alongside Mohammad Hafeez which is 50% more than the previous highest by a Pakistani opening pair ever, overtaking Ramiz Raja/Mudassar Nazar & Saeed/Sohail. That is a reflection of his performances & consistency which has resulted in stability & continuity in first choice selection matters. He has been involved in the most 100+ stands for the opening wicket by a Pakistani opening pair so has been providing starts & foundations for the middle order to build on. Younis Khan has publicly said that Azhar Ali’s emergence & revelation at number 3 has reduced the pressure & burden on him & allowed him to settle into an easier position at number 4 to consolidate on a firm top order display. Azhar Ali has been doing wonders at number 3 as his 50+ test average in the 15 test matches under Misbah ul Haq shows. Not only is he technically well equipped in defence & tactical awareness, but has the mental toughness to absorb pressure up front, after all men with balls do the hard yards of batting at 3. Hence, needless to promote Azhar to the opening slot, both from an individual & team point of view. In comparison to his opening partner Taufeeq has been the better & more consistent of the performers. Mohammad Hafeez has scored 2 centuries against Bangladesh & Zimbabwe & 3 50s in 29 test innings. Taufeeq is technically & temperamentally the better of the openers. Not that I am indicating that Hafeez is to be dropped or should be as he is an effective bowler even in the longer version of the game when it comes to nipping out left handers, breaking partnerships & genuinely troubling the batsmen with his guile. He can be a defensive & attacking option with ball in hand. He is also a key part of the whole think tank & fields decently in important positions. However, if you are putting the argument that Taufeeq has to be dropped, then Hafeez who primarily is meant to be in the team for his batting also has to be dropped; otherwise it is ill-logical. Taufeeq is a safe as houses fielder in the slip cordon & one can even put his name in the hat for the contention of being vice captain of the side as he has abundance of domestic experience & earlier this year led Punjab to the Pentangular Cup trophy. He has been around the block for a while, even though there was a large period where he was out of the side. For the record he is the 2nd most capped batsmen in the side after Younis so has the experience. This should come in handy. As always there is pressure to perform when you are playing test cricket, but Taufeeq was the leading run scorer with a 236 against Sri Lanka in the Emirates towards the end of last year so should be fairly confident of performing well against the Lankans in their own back yard as well. Statistically, Pakistan’s best opener after Saeed Anwar. Taufeeeq is a traditional solid defensive opening batsman content on batting time, content on batting long periods. With an attritional game plan Taufeeq has the capabilities to display the virtues, strategies & principles the highest form of the game demands, particularly on Asian wickets where one has to scrap hard to make it count in the heat & humidity.